This was a really good freebie political/suspense thriller with treasure hunting, a secret political club with deep control over world affairs, and layers upon layers of intense plotting. 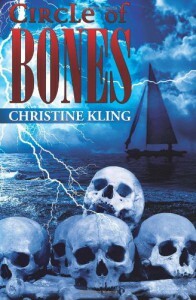 There is no doubt the author has deep knowledge about all things nautical. She did a great job blending facts with fiction, including the historical search for an actual missing WW2 submarine lost over 60-years ago. If you are a romance fan like me, you should know that is does have a strong romance element but this is not a traditional romance book. The ending leaves us open for a sequel, so we might see more of Cole and Riley. (One mildly steamy romance steam, some great chemistry between two likable characters, the 'L' word is used, and the possibility of an HEA still exists by the end). Cole and Riley find themselves working together to locate a missing WW2 submarine that was lost over 60-years ago, and which Cole believes holds the secret that got his father killed just three years past. To make it more enticing, he is certain there are gold coins on the submarine as well. It was a beefy read at over 500 pages. I really enjoyed it, especially given that this isn't my normal type of read. It did have its weak moments at time with the plotting, and I did question some decisions that were made, but mostly it was a tightly woven suspense thriller. There was also quite a bit of 'bad guy info dumping' that I get frustrated with. ((Why is it bad guys always have to give a full confessional before they can kill the hero or heroine, only to be foiled because they spent so much time talking?)) I also had some issue with the ending, and I don't mean the wild coincidences that occur. Toward the end of the story, with a bad guy out to kill them they a) return to the exact spot the bad guys will find them, and then b) they split up instead of staying together. Riley is out of sight, on her own, with only radio contact available. It worked for the high-action ending, but I did not believe for a second these characters were so careless to make this deadly, stupid decision. Overall, this was a really good political/nautical suspense/thriller read with complex plotting and intrigue. If this is your cuppa, my guess this is one of the better books out there in this genre. If you prefer reading romances, this might be a disappointment but it wont miss the mark completely. Lastly, I got this one for free at Amazon, so a big thank you to the author for the great opportunity to find it and read it.